This Starter Pack from The Wasabi Company is the perfect introduction to fresh wasabi. 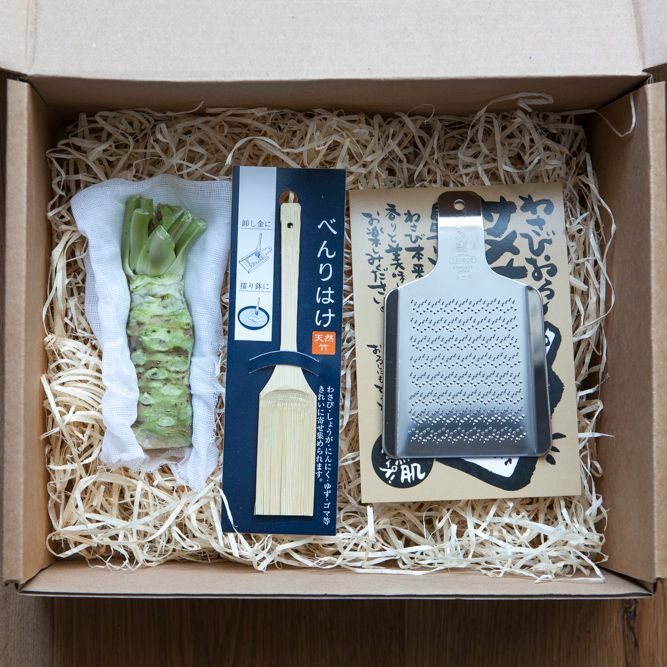 Wasabi is very difficult to grow, and had never been successfully cultivated in Europe until The Wasabi Company began growing and harvesting fresh wasabi on their Dorset and Hampshire farms. This set makes a fantastic and unusual gift, ideal for cooks and wasabi enthusiasts. Each prized rhizome takes at least 18 months to reach harvest. 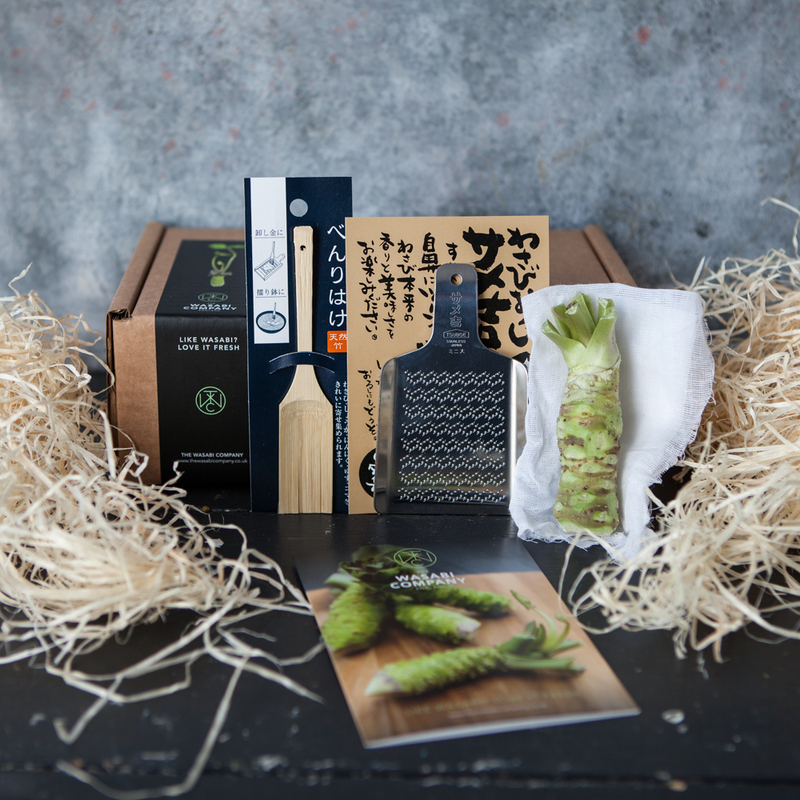 Finely grating it breaks down the wasabi at a cellular level, instigating an enzyme reaction that delivers an aromatic, fresh flavoured pungency which has a natural sweetness. Fresh wasabi is traditionally paired with sushi and sashimi, however it is very versatile and can also be used to flavour dressings, butters, sauces, ceviches, gravadlax, sorbets, foams and meat or fish. The grater included is specially designed to help you create finely textured wasabi, while the bamboo brush is perfect to remove wasabi from the grater. 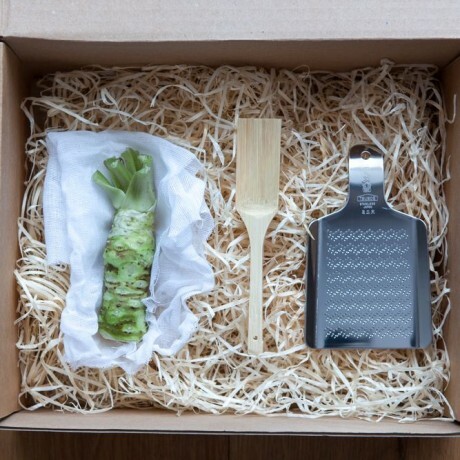 Everything comes presented in a presentation box, to make a wonderful gift. Rhizome Storage: The rhizome will store well for two weeks or more when individually wrapped in damp paper towels or the muslin cloth in which they are sent. Store in an uncovered bowl in the fridge. CHRISTMAS DELIVERYCHRISTMAS ORDERSIf you are purchasing one of our fresh products as part of your order and would like us to deliver as close to Christmas as possible please write “Christmas order” in the special delivery instruction box during check out. We will then dispatch on the dates below to time the arrival for Christmas. 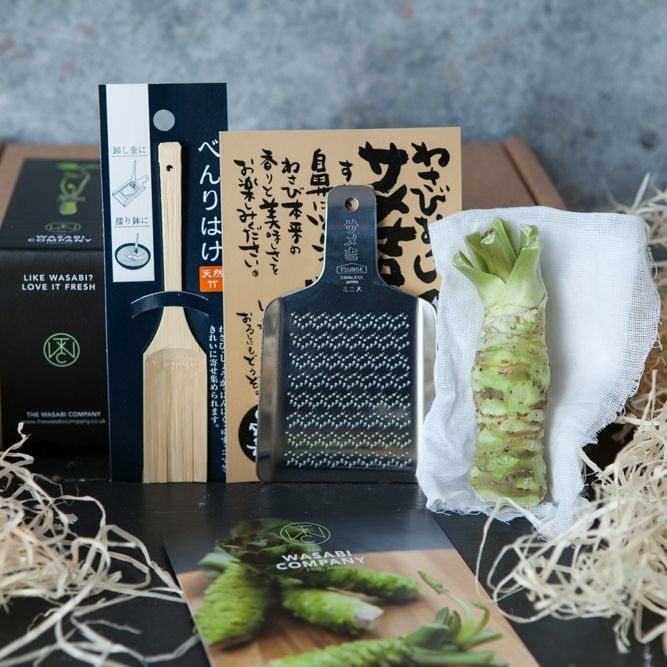 Fresh products are: Wasabi rhizomes, Wasabi plants, Fresh yuzu other (non-fresh) orders will be delivered according to standard delivery terms. This product is dispatched by The Wasabi Company. This item has a shipping weight of 427g.